The George Maciunas/Fluxus Foundation is pleased to present the conceptual web exhibition, Knowledge as Art: Chance, Computability, and Improving Education, in its newly renovated exhibition space at 454 West 19th St. The new science and experimental philosophies of Thomas Bayes, Alan Turing, and George Maciunas sought to diagrammatically organize the factual clusters of the universe. As knowledge workers, their conceptual corpus is monument to the notion of knowledge as art. 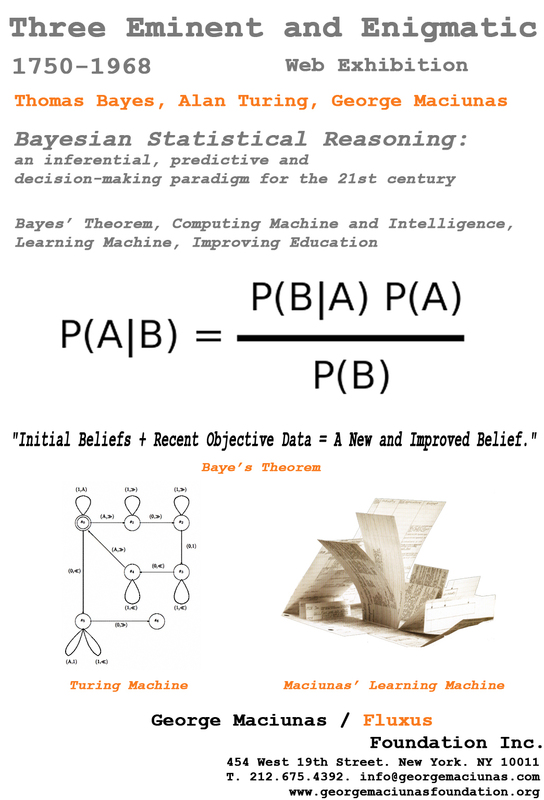 Rev.Thomas Bayes, 18th century English experimental philosopher and mathematician, developed an elegant statistical theory which provided a versatile way of optimizing one’s suppositions to reach an accurate prediction. Its methodology, which is used to create models that learn and adapt to new information, has been used in a universal range of applications including medical diagnosis, ecology, geology, computer science, artificial intelligence, machine learning, genetics, astrophysics, archaeology, psychometrics, education performance, sports modeling among others. British mathematician Alan Turing used Bayes’ Theorem to decipher the uncrackable Enigma code during World War II, a feat which arguably saved the Allies from losing the war. In turn, Turing used its principles to develop the Turing Machine, a conceptual ‘machine’ which has greatly contributed to the field of artificial intelligence and digital computing. Bayes and Turing’s theoretical ideologies are expressed the diagrammatic solutions of Fluxus sage, George Maciunas American-Lithuanian artist. His aesthetic of organization sought to create an ‘actus purus’ of unfragmented knowledge. The exhibition is also complemented by three paintings of Maciunas from the 1950′s, which may be regarded as the visual counterparts to Maciunas’ research on Eastern chirography and Western epistemological paradigms. These canvases, which combine aesthetics of the ancient Far East and the Western avant garde, evoke a nostalgic exploration of figuration and abstraction. Reflecting the pantheistic nature of the Eastern mentality to view the universe and God as one and the same, each painting represents a pure moment of structural unity in their compositional relationship between fluxions, textured spaces, and bold figuration. The exhibition, organized and produced by Harry Stendhal, opens on March 9 and continues through April 28, 2012.